All transactions are safe and secure with a reliable history in online purchasing behind each of our associates. 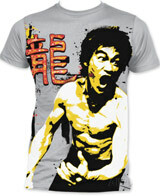 Buy the Enter the Dragon Scream t-shirt to own Bruce Lee clothing and merchandise. These grey Bruce Lee t-shirts feature the martial artist in the 1973 movie Enter the Dragon. Pair it with a Bruce Lee face design or a Game of Death costume for the perfect tribute to the legendary star. Celebrate the iconic martial artist who was born "Lee Juan Fan" and grew up to master both dance and the martial arts. This grey Bruce Lee tee is as cool as the man himself. Pair it with a collectible Bruce Lee action figure or an attractive Enter the Dragon movie poster for the ultimate gift. In addition to the Enter the Dragon Scream tee above, browse the Bruce Lee Clothing Gallery for more apparel like men's and women's clothes, kids shirts or hoodies.